Home / ANIMATED FILMS / MOVIE TRAILERS AND INFO / RPG Metanoia 3D movie trailer, plot summary and information! The RPG Metanoia 3D movie story revolves around an avid online game named Nico who as an eleven year old boy lives a normal child's life. But when he is playing the MMORPG (Massively Multi-players Online Role Playing Game) called Metanoia, he is an unpredictable vagabond armed with a magic yoyo and with uncanny speed and agility in his skill set. Nico got low self-esteem and is only getting his guts from playing Metanoia. That is why when he and his friends where faced with an adversity from the local boys, he felt his world shattered. But they found a saving grace from a new friend which inspired them to continue their online endeavor. However, the Metanoia network was infected with a virus affecting the whole internet, most computers and the minds of gamers all over the world. It's up to Nico, his friends and the other remaining Metanoia players to stop the virus from taking control of the online and offline world. But to do that, Nico must muster his courage, and discover the true hero he really is. The RPG Metanoia 3D movie will be an official entry to the 2010 Metro Manila Film Festival. It will be Star Cinema's second entry, alongside Ang Tanging Ina Mo Rin (Last Na To) starring Ai-Ai delas Alas. According to reports, the RPG Metanoia 3D movie will feature the voices of Aga Muhlach, Zaijan Jaranilla, Mika dela Cruz, Vhong Navarro and Eugene Domingo. In 2008, the animated movie Dayo also entered the Metro Manila Film Festival. But compared to RPG Metanoia, Dayo only used the mix of traditional animation and 3D animation. The RPG Metanoia 3D movie is a joint production of Star Cinema, AmbientMedia and Thaumatrope. and will be the first-ever 3D animated feature film in the Philippines. The RPG Metanoia 3D movie trailer features the main character Nico in his simple life as a child and his active life in the online world through the online game Metanoia. The movie will tackle how an online game can inspire and push a kid to become the man that he wants to be and to build the future that he is dreaming of. It is a story of courage, inspiration and camaraderie. The RPG Metanoia 3D movie trailer is courtesy of AmbientMedia from its official website www.therpgmovie.com. Another Update! 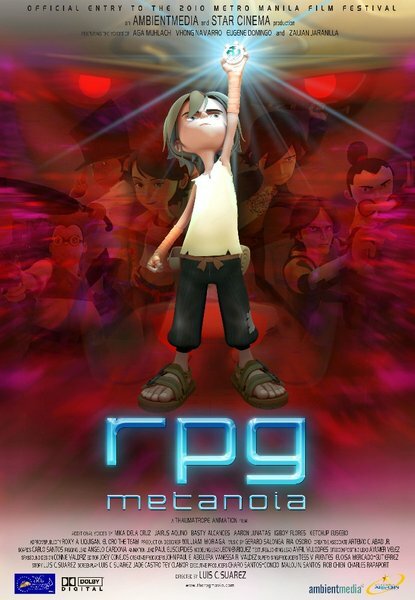 (11/08/10) Here is the Official Movie Trailer of RPG Metanoia 3D released by Star Cinema today. In the official movie trailer, we finally hear the voices of the characters. The prominent voices in the trailer are the voices of Vhong Navarro and Zaijan Jaranilla. We now also have a stronger grasp of how the story will unfold. RPG:Metanoia is one of Star Cinema's entries to the Metro Manila Film Festival 2010 along with "Dalaw" and "Ang Tanging Ina Mo, Last Na 'To" and will be showing on December 25, 2010.